In California, a photo by Ayala Moriel on Flickr. The best part of traveling is getting lost. 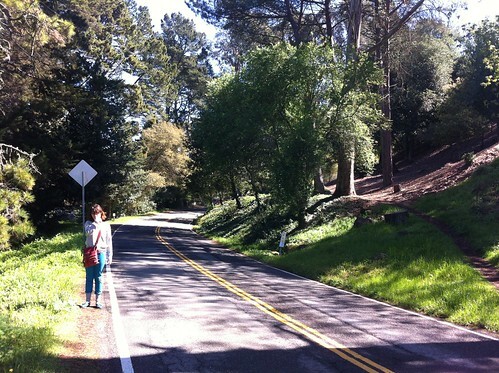 I had two days for playing tourist in San Francisco, and most of them I actually spent in Berkeley because of a couple of injuries I had to be careful about. The first day was still raining and misty and cool (Wednesday, March 20th), we took the ferry from Jack London Square to the Ferry Building, got our fill of cutesy pastry shops, hopped on a cable car (so we don't need to walk, aforementioned injuries still in effect), and ended up at the wrong side of Powell street (wrong being needing to go downhill). Taking a cab for 5 blocks down Powell, I finally but sought refuge from the pain at Barney's, where I spotted a couple of favourite new perfumes (I'll tell you about them later). It might have not have been fun at the time, but I'm already remembering it fondly. We toughed it out, and survived. 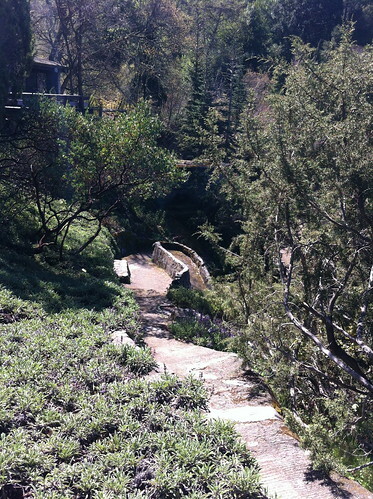 The second day (being Thursday, March 21st), the sun finally showed her lovely face on Northern California again, and I decided to be adventurous again and go to the UC Berkeley Botanical Gardens, which I tremendously enjoyed in my last visit to the Bay area. Information about how to get there by public transit is nearly non-existent. But for the record: you should take the Bear Bus, a black vehicle that serves the inter-campus transportation within UC Berkeley. There are clear signs for the bus stops where it does stop; but you actually have to wave it down. Of course, I did not know that at the time, and let a Bear Bus slip by. So I hopped on the No. 65 (from the corner University & Oxford), the line that was promised to be stopping "very close" to the botanical gardens. Somehow the route did not look right. But what else is new with public transit? They are known for their roundabout. I got off where I was told I should, and a lovely lady gave me directions. I was puzzled at how completely different the place was than what I thought I was visiting. 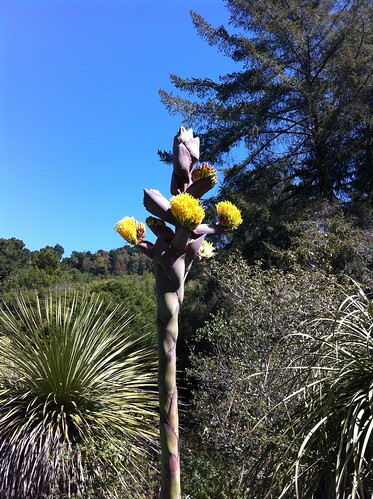 Turns out I was heading to the Tilden Regional Park Botanic Gardens, which are "much better", as the lady assured me, "they are free". OK, I thought to myself - this could go either way. I walked on following her instructions to the best of my ability. There was no sign in sight for the Botanical Gardens or any gardens for that matter. I avoided the gold course, as per her instructions - only to find myself walking slowly up a hill alongside the very same gold course I was instructed to avoid. After about 20 minutes of walking, and no gardens in sight except for the gold-course fenced-up green, I've decided to stop a car for directions. And we got a lift right to the gate of the gardens from a young gentleman who was driving that way anyway. Upon entering the garden (a vague point in space, when there are no gates or admission) I immediately thought to myself - no surprise this is free. It's just a bunch of native Californian plants growing about, with some plaques stuck every now and then to indicate their botanical names. Well, that was just the tourist way of looking at that. 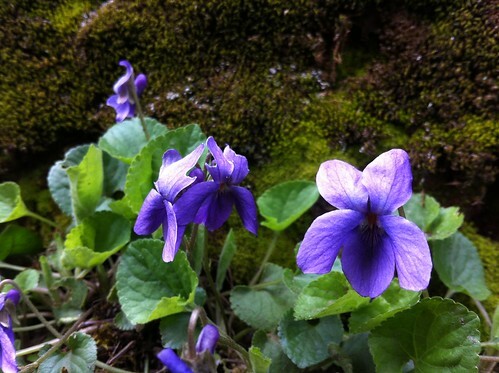 If you love plants, and especially if you are a perfumer - every garden is a little piece of heaven. This particular one happened to be a perfumer's heaven. A very rustic perfumer, to be exact. The air was filled with the scent of aromatic plants warmed by the sun - sage (aka artemisia) of all shapes, sizes and kinds. 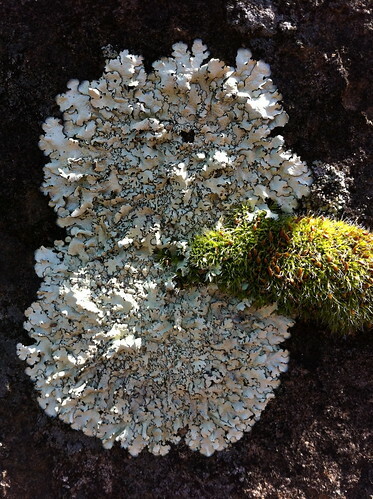 Cacti in full bloom, towering over the sun-warmed lichen-covered rocks. 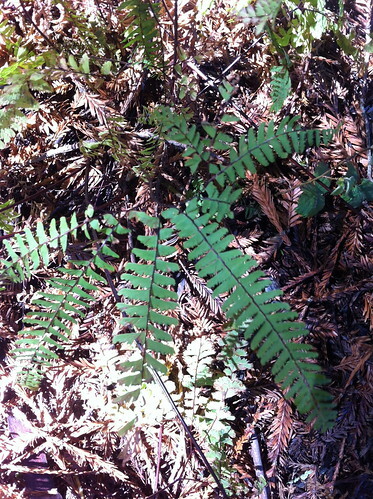 Sweet scent of pollen and the vegetal, surprisingly barely evergreen at all scent of redwood needles. And the opportunity at every corner to just bask in the sun. What more can a tourist ask for? Pitosporum, a photo by FOTOGRAFIES CATA on Flickr. 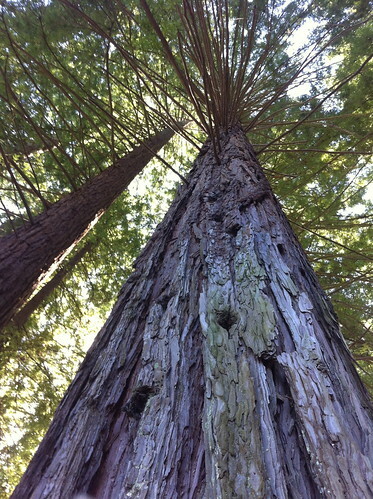 After our brief Portland encounter, we arrived in Berkeley in the late afternoon of Tuesday, March 19th. First of all, it was raining, in California - which is a most profound cognitive dissonance for a Vancouverite (and what we supposedly hate the most when on vacation). I didn't only not mind this rain (which was soft, and slightly warm, at least in comparison to its relatives up north). 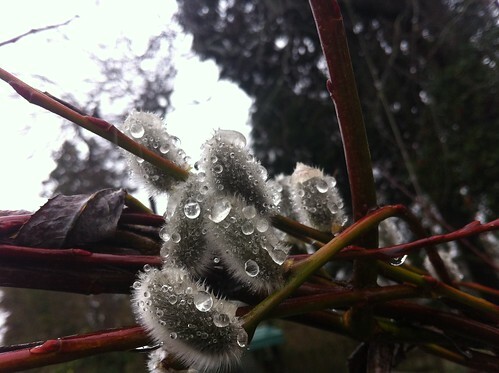 I liked the smell of the rain, which we rarely actually get in Vancouver (where it rains about 90% of the year). Besides, I wasn't exactly on vacation. I had lots of work to do - and the lack of sun would make me feel less like I was missing out on fun. Secondly, the street dwellers of Berkeley turned out to be the most colorful bunch, and far outweigh their brethren in Vancouver in most categories (except, perhaps, politeness). To prove my point: they were wearing war paints all over their face when we arrived, made probably from flower pollen and exotic spices. Thirdly and lastly - the air smelled fantastic, and it wasn't just the rain hitting the dry pavement; and it wasn't laundromat either. I spent the remainder of my time trying to find out where the smell came from. And it turned out that the majority of Shattuck Avenue is lined with tall evergreen trees, whose blossoms release the most intoxicating aroma reminiscent of osmanthus, orange blossom and orchid. A few days later, I learned from Bruno that those trees are non other than Pittosporum undulatum. I'm not sure which kind exactly, but they certainly grow tall, beautiful and fragrant - something you might want to consider when planning your garden! Visit Té de Violetas for a report and more photos of the Artisan Fragrance Salon, from all the different perfumers. I've been on the road and way too busy to blog much, and am just arriving in Vancouver now. In the meantime, until I unpack and get over travel-fatigue and gather my thoughts and photographs from my many adventures at the Artisan Fragrance Salon and beyond - you can read about my little perfume company's 12th anniversary on Fragrantica, and indulge in a favourite perfume of your choice. All products are 12% off until the end of March. This is only while quantities last, and can't be combined with other discounts (i.e. : sample packages or wardrobes). It applies to everything else though, and you will get manually refunded after you checkout your cart - if you either send a comment in the checkout (part of "instructions to seller" - or an email to wish me happy 12th anniversary. Happy Spring Equinox, and Happy Persian New Year! I've spent the last few days on the road, taking the train to Portland, where I stayed with the lovely Trish of ScentHive and her equally lovely family. It was an unusually dry and bright sunny day, and we strolled through the famous Rose Gardens which were only beginning to send red-green tender leaves, full of promise for happy summer. Her neighborhood is filed with gardens, which are at least one month ahead of Vancouver's spring weather: the daffodils were in full bloom and there were gorgeous sweet violets (which I can't even find in a nursery in Vancouver, and don't bloom till the summer if anyone is even growing them!). 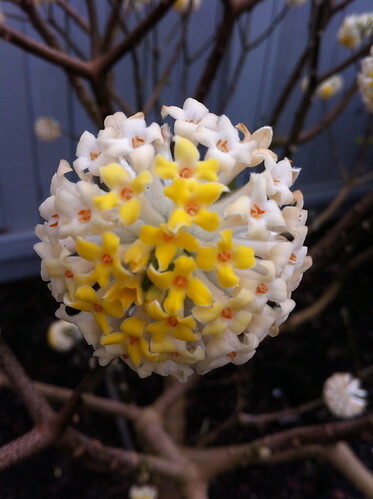 And I even met a new flower - Edgeworthia chrysantha, related to daphne, and beautifully scented to boot. Its delicate scent filled the damp and ever so slightly warmer spring air, with a delicate, clean floral scent, with hints of citrus overtones and clean-woody undertones. 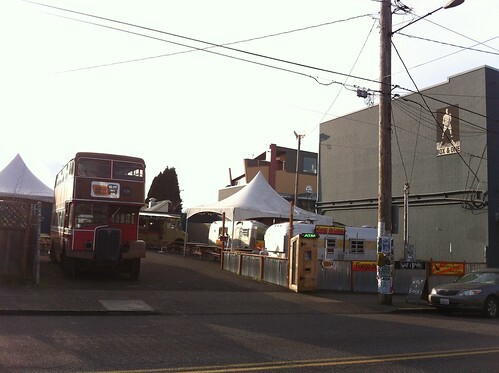 And a street corner like that - which pretty much sums up the culture of Portlandia - wooden ATM booth, food trucks, wacky architecture in the background, and across from it were two very rad stores - one for making your own terrariums, and another that is stuffed with glowing gnomes of all sizes, Easter eggs, Day of the Dead skeletons, and just blatantly mismatched paraphernalia of all ends of the spectrum from hideous to Disney-kitsch. And now I'm in Berkeley, preparing for an afternoon tea for all the perfumers in the area, and those attending the 2nd annual Artisan Fragrance Salon. It is hosted at Alembique - and up and coming boutique for the art of perfumery, just off the beaten tracks near Gourmet Ghetto. Miss T is here to help and just overall keep the morale up for this rather ambitious operation (i.e. 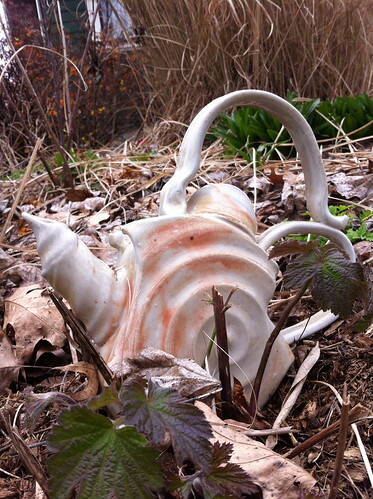 : hosting a tea party a day before a big show, and all very far away from home!). We are soaking up the Bay goodness (although so far we've mostly seem to have broken the drought in the area and began our stay with 2 days of rain!). New Packaging & 12th Anniversary Sale!!! Ayala Moriel Parfums is turning 12th this March, and to celebrate our "Bat Mitzvah", we designed new packaging! This offer is also effective for minis, Signature Perfumes and for our One Of A Kind perfumes! Also - For the serious perfume nerds among you, there is 1 last spot remaining in the Floriental Week Natural Perfumery Course. This is an opportunity of a lifetime to study natural perfumery in Ayala Moriel's studio in the heart of beautiful Vancouver. * Qualified orders will be refunded after the order went through checkout. Valid thru March 31st, or while quantities last. Valid only for purchases of in-stock perfumes that are still in the old packaging (this is no catch, we have a lot of stock!!!). Can not be combined with other offers, and not extended to sample sizes, body products or candles. New Packaging + 12th Anniversary Sale! What do I have in common with a tattoo parlor, a bloodhound hunter and a volunteer piano teacher? We all appeared in episode 429 of TELUS Optik's myVancouver. Watch it on Vimeo and YouTube, where you can get a glimpse into how I compose, blend and sniff perfumes at my home studio. Full of sweet dreams, and health, and quiet breathing". But is it really? After all, beauty is about as fleeting as could be. If the world's virtues could be categorized based on their evaporation rate - beauty would rank high up there with the top notes. The most beautiful things are momentary, not eternal: a perfect snowflake on a child's palm rapidly melting away only to become a shapeless wetness. Vibrant colours fading in the light; flowers wilting and losing their seductive appearance and alluring scent. And no matter how hard the beauty industry will try to sell you creams, potions and plastic surgeries - youth does not last forever, which is precisely why it holds so much more esteem than it deserves. But what is beauty? And why is it so important to us? I won't attempt to do better what generations of philosophers, artists and aesthetics thinkers have been dedicating their life for. Beauty has been better defined, described and looked at from every possible direction before I even came to be. The desire for proximity to beautiful object, people or animals, as well as mating with them could be a survival mechanism, or a strange human desire for the average. Beauty could also be a mathematical principle by which the universe is built and artists and architects try to mimic. Beauty could be any number of things, but what's important to me personally is how beauty affects me, and if there is any significance to it beyond the superficial pleasure it brings to those in proximity to it (it's interesting to note that beautiful people, while perhaps getting more attention and opportunities in life, are not directly enjoying their own "beauty" per se - unless they are obsessive mirror-gazers). "If you have never seen beauty in a moment of suffering, you have never seen beauty at all. If you have never seen joy in a beautiful face, you have never seen joy at all". Full of sweet dreams, and health, and quiet breathing"
But we must differentiate between pleasure and beauty. For pleasure is greedy and short-lived; while true beauty surpasses it's own life and exists beyond its sensory experience. "The roses of pleasure seldom last long enough to adorn the brow of him who plucks them; for they are the only roses which do not retain their sweetness after they have lost their beauty." (Hannah More, Essays on Various Subjects, On Dissipation). Interestingly, the origin of word for beauty in Koine Greek is the word which means "hour": ὡραῖος, hōraios - is ὥρα, hōra. In other words: a thing of beauty is "of it's time". It does not pretend to be older or younger - but is in the moment. Which brings me to another thought: the true virtue of beauty lays not in youth; but in the whole cycle of life. And once you see the snowflake and the cold wetness as two sides of the same coin - you realize that beauty is life, and death, and it is everywhere. As an artist that creates in the fleeting realm of scent*, I ask myself if what I do accounts for anything, or does it really have any impact of importance on making the world (even slightly) better? The older (and hopefully wiser) I get, the more I realize that things are best viewed simply for what they are. The answers lay right in front of us, and inside our subjective yet very truthful experience. All we need is to be mindful and take notice. Or as Confucius says: "Everything has beauty, but not everyone sees it". * An art form that is somewhat endangered by various factors which I prefer to not think about too much ever so often - IFRA regulations, the diminishing supplies of natural raw materials, and the growing number of scent-free workplaces. 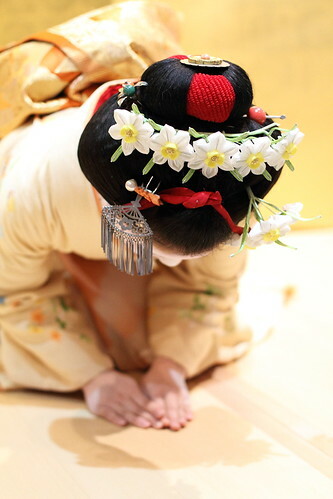 Osmanthus Oolong by Providence Perfume Co.
Suisen Kanzashi, a photo by Teruhide Tomori (◠‿◠) on Flickr. What you're about to read is the first in a series of several interviews or conversations with 3 perfumers about the wonders of osmanthus and their experience working with this beautiful and rare raw material. I hope that you will enjoy the insight into other perfumers' work with the same special material, and if you have any other questions, feel free to post them in the comments below and and converse with these talented perfumers over SmellyBlog, and the first "guest" is Charna Ethier from Providence Perfume Co, a natural perfumer from Providence, Rhode Island. Thank you for participating in my osmanthus series on SmellyBlog! Charna Ethier/Providence Perfume Co.: Thank you for allowing me to participate. I'm excited to be a part of your osmanthus series! Ayala: How would you describe the scent of osmanthus? Charna: I would describe the scent of osmanthus as fruity, leathery, slightly smokey, sweet, floral and narcotic. Osmanthus doesn't smell like any other essence and is distinct and unique. Ayala: Interesting that you say plum! I never really thought of osmanthus this way before. 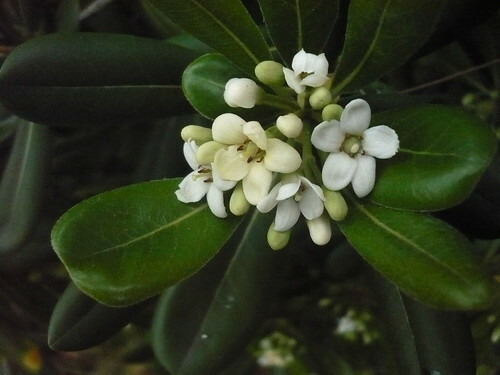 Femme smells like osmanthus to me, yet it is not listed as a note anywhere, while plum is. Charna: Femme does smell like osmanthus! 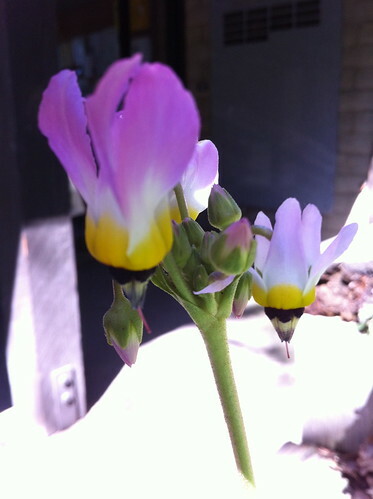 Charna: Sadly, I've never had the chance to smell the real flowers. Charna: I once had a confusing conversation with a student over the phone about the fresh flowers. She lived in Georgia and she kept asking me about tincturing "tea olive." She wanted to know how to create a tea olive tincture and told me that tea olive grew wild everywhere in the South. I was confused and told her I wasn't sure what tea olive was, but I was pretty sure it didn't grow wild in my cold climate. She kept describing the flowers to me in detail, and the aroma and still I had no idea what flower she was talking about. She called me again a week later and explained she discovered that tea olive was what we chilly "Yankees" called osmanthus. She has a great sense of humour. Ayala: Confusing indeed! For me, growing up in the Middle East - when talking about "olives" I rarely think of their flowers, and the association is more “savoury” than “sweet”. So the synonym “sweet olive” sounds a bit out of place. Do you have any scent memories associated with the scent of osmanthus? Or memories that are triggered by this note? Charna: For some reason, the aroma of osmanthus often reminds me of plum wine, ume -which in turn reminds me of an old boyfriend who used to buy me plum wine. He was much too old for me, and I think he though all young women in their 20's liked to drink sweet things. Ayala: Mmm, ume… I love Japanese plum wine, but then I probably have an 8-year old taste in alcoholic beverages!… I truly adore ume - their scent is what inspired my Hanami perfume even more than sakura (cherry blossoms). Have you ever had the Japanese sour plum condiments? They are so peculiar tasting! What were the main challenges for you when incorporating this note into your perfumes? Charna: I find osmanthus tricky to work with. It's an essence that doesn't like to play well with others, it asserts itself and likes to play the starring role. I made a conscious decision to let osmanthus be the star of my perfume Osmanthus Oolong and built the fragrance around osmanthus. Ayala: To me, osmanthus had the opposite challenge: it seemed to disappear the more I put of it. But then, my composition relied heavily on osmanthus absolute being the only flower there. The others were added in only minuscule amounts, so it remained very muted. Projection does not seem to be a strong point - and it could also be something to do with the ionones playing tricks on our olfactory bulbs. But you managed - in what seems effortlessly - to turn osmanthus into a star! "Osmanthus" and "Oolong" - two of my favourite teas! Not surprisingly, I've also fallen hard for your creation! What was your inspiration? Is there a story to be told about Osmanthus Oolong? Ayala: You now not only answered my question, but also made me feel just a tiny bit more normal - not being the only one who does perfume problem solving while falling asleep… The solution sometimes just comes to you this way more at ease, like a meditation. Your osmanthus perfume is tea themed, yet the result I found to be very animalic, and with a surprising lasting power. I find that osmanthus to be a very challenging raw material in that aspect: it is difficult to make it long lasting; and increasing the concentration strangely diminishes its presence. How did you overcome this technical challenge? And what other challenges did you notice when working with osmanthus absolute? Charna: I think the animalic aroma stems from the indole in the jasmine blending with the leathery note in the osmanthus. As I mentioned before, I find osmanthus challenging to work with. I had hoped by incorporating the lemony aglaia, the sharp astringent black and green teas and bergamot I could balance the sweet, sometimes cloying nature osmanthus can possess. What I guess I'm saying is there needs to be a lot of balance when working with osmanthus! Ayala: You have achieved this balance so well. The red rooibos tea truly brings out the fruity aspect; yet it is not too sweet. And most importantly - it projects very well for such a delicate tea-inspired perfume. Charna: I feel that when blending with osmanthus, one must decide if they wish to highlight the flower's floral note, it's leather note, or it's fruity note. One of the three elements as they are so distinct. Ayala: Excellent point! Containing one's excitement are a great challenge to the perfumer, which can easy lead to lack of direction. Having a focus is key, because the natural raw materials are so complex, our job is often like a photographer's attempt to soften the background and channel our attention to the photograph's subject. Charna: Regarding the longevity of Osmanthus Oolong . . . thank you for noticing! I take great pride in striving to create a longer lasting natural perfume. One of the methods I utilized with Osmanthus Oolong tincturing dried apricots and peaches in the base alcohol. The alcohol becomes imbued with the fruity aroma, a perfect foil to highlight the peach-like aroma osmanthus possesses. In addition the fruit tinctured alcohol contains natural sugars from the fruit which act as a humectant slowing the evaporation rate of the perfume off the skin. Ayala: That's fascinating about the fruit sugars - I had no idea! I worked with natural fruit extracts (designed for food, just like vanilla extract or almond essence) found their stickiness to be a disadvantage. It's both inspiring and encouraging to smell such results, so I will give it a try. Have you noticed a great deal of different between osmanthus essences from different sources? Do you have a favourite - and why? Charna: This is an interesting question. Normally, I find vast differences in essences from different sources. I must admit when sourcing osmanthus absolute, the differences were more subtle, shades of grey if you will. One was thinner, less sweet. One was smokier. Maybe because osmathus is such a distinct aroma I detected more subtle differences. I recently purchased osmanthus from Eden Botanicals and really liked the quality. I found it interesting that the osmanthus from Eden smelled smokier and darker in the bottle than it does on the skin. The smokey note disappeared very quickly, and the sweet, floral quality shone. I enjoyed it. Ayala: Yes, the osmanthus from Eden is exceptional, and even surpasses the one they used to carry a few years back. Osmanthus is not widely grown so we're not privileged enough to have several sources as with other florals (rose, jasmine, etc.). I'm ashamed to admit that I've never smelled aglaia flowers. Can you describe their scent? Charna: I LOVE aglaia. I only wish their fresh, lemony floral aroma were stronger. It's very difficult to make aglaia a prevalent note in a perfume, but I found the aglaia and jasmine lightened the osmanthus in the heart notes of Osmanthus Oolong. Ayala: Now I'm even more intrigued! Which types of tea essences did you use in Osmanthus Oolong? Charna: I used a handcrafted tincture of black tea (hence the dark color of the perfume), green tea absolute and rooibos (red) tea absolute. The fruity plum notes in the rooibos accentuated the other fruit notes in the perfume. Ayala: Wonderful choices, and the tea-like quality really comes across - although in a rather bold and daring way. Thank you so much for creating such an outstanding osmanthus perfume, and for sharing your creative process and thoughts! Charna: Thank you for allowing me to participate, Ayala! Now, proceed to read my impressions/review of Providence Perfume Co's Osmanthus Oolong! Lovely bi-lingual (Spanish and English) review of Espionage perfume in Té de Violetas. Pandan-flavoured gelato is a smooth, heavenly fragrant yet subtle way to not only enjoy this unique flavour; but also incorporate coconut milk into your diet, which will make your gelato even healthier than home-made gelato already is. - Freeze in an ice cream maker according to manufacturer's directions. Most homemade ice creams and gelato need to "ripen" for an hour or more to come to a more firm consistency without melting immediately. - Serve alone, or along with fresh fruit or deep friend bananas. Pandan Leaves (Pandanus odoratissimus), a photo by Ayala Moriel on Flickr. 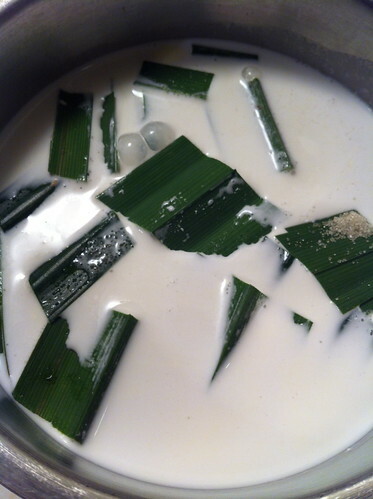 You might have tasted Pandan without even knowing it. It's used primarily in Southeast Asian cuisine, in almost all desserts, so much so that it's been coined the "vanilla of the east"*, i.e. 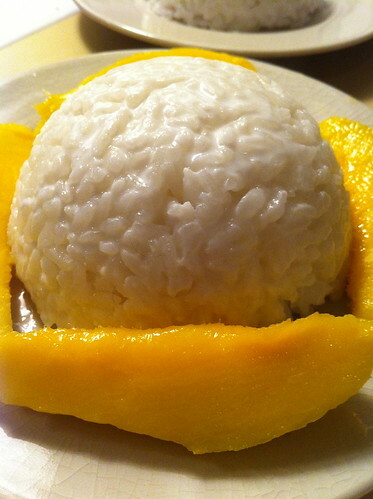 : in coconut custard, and mango sticky rice, a very popular Thai dessert, is in fact cooked with pandanus leaves, tied in a knot and removed once its sweet aroma has been infused into the rice and the coconut milk, and of course there are the less traditional but not any less popular pandan flavoured ice cream and gelato, and other simple custard-like European desserts such as Crème brûlée and panna cotta. 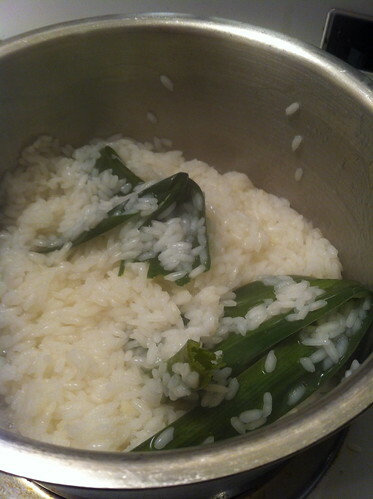 It can also be wrapped around rice, and steamed, much in the same way as banana leaf, imparting a smooth fragrant aroma that is complementary to the rice. Pandan leaves behind it a fine, subtle aroma that is so representative of Asian cuisine and aromatics: the aroma is reminiscent of roasted tea leaves, milky oolong, almond cream and basmati rice. And the taste is subtly sweet, like the smooth finish of fine green and oolong teas - sweet at the back of the mouth and the top of the palate. 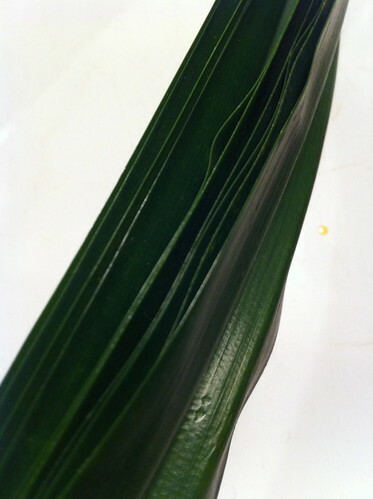 You can incorporate it rather easily into dishes, savoury or sweet, by tying them into a knot and infusing the liquids with it; or using pandan essence (can be found in some Asian markets and grocery stores), or create your own pandan "juice" by covering cut leaves with water, and blitzing them in a food processor, followed by straining. You'll get a green juice that can be used just like vanilla extract in baking cakes (and won't turn it green either, just like vanilla extract won't turn your whipped cream black!). Kewda attar, from the pandanus flower oil which is either macerated with sesame seeds or oils, or distilled into sandalwood oil, produces a fine and unique essence. Kewda attar is distinct, exotic, floral, reminiscent of a tropical jungle and flowers all at once. 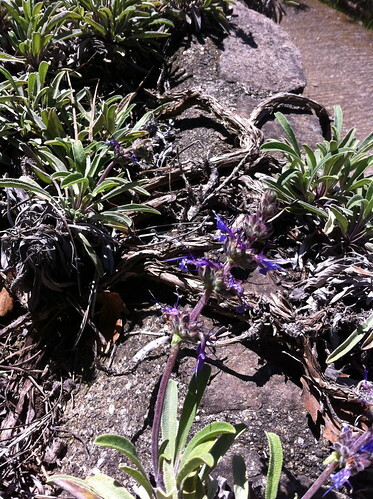 Kewda is extremely heady, and may be perceived as sharp when first smelled. 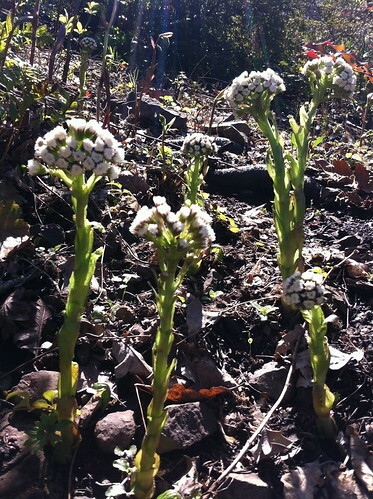 The sharpness being somewhat green, and mostly reminiscent of horseradish. However, the sharpness is underlined by a unique sweetness and warmth. 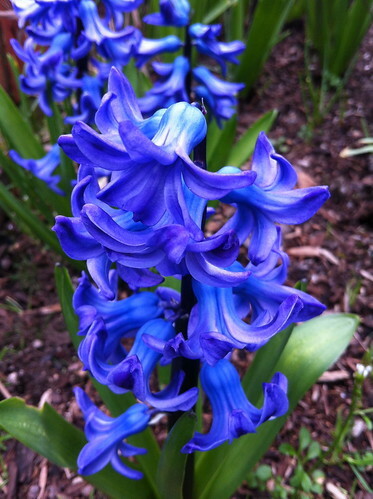 The scent of kewda is unlike any other scent, though some may compare its dry out sweetness to that of hyacinth. The main constituent responsible for its characteristic scent is beta-phenylethyl alcohol(which makes up to 60-80% of the oil). Kewda is mostly used in Indian traditions as a perfume and as a medicine, and hardly made its way to Western perfumery. Although pandanus flowers (aka kewda or kewra) are very popular perfume material in India, I could not find any documentation on using the leaves for perfumery. 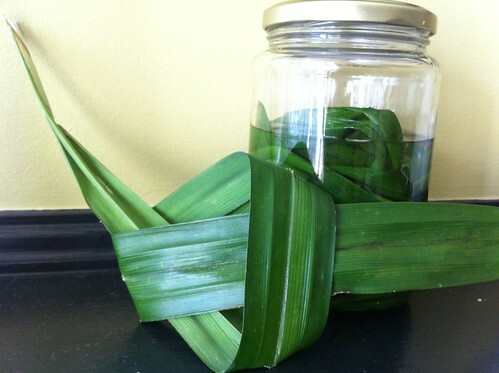 Out of curiousity, and rather on an impluse, I have began to tincture pandanus leaves in a jar of ethanol and am now crossing my fingers, hoping for the best. * Interestingly enough, the plants of pandanus have also been used as the foundation to support vanilla orchids in the plantations in Madagascar and the Reunion Islands.